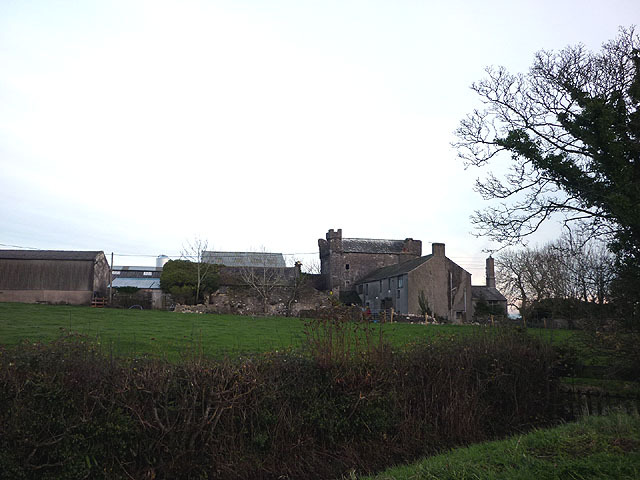 Notes: A mile to the south, Wraysholme Tower is a 15th-century pele tower, used as a barn and cow-house, adjoining a 19th-century farmhouse. The tower was built by the Harrington family of Aldingham. A Michael Harrington acquired a grant of free warren in Allingham in 1315. The tower is 40 feet (12 m) by 28 feet (8.5 m). It has axes north and south and is built of local limestone rubble, with angle quoins. The walls are 4 feet (1.2 m) thick at their base. There is a projecting garderobe, about 7 feet (2.1 m) square, at the south-west corner, where there is a spiral staircase. There was originally an entrance at the north-west corner. The building is roofed with slate. "Wraysholme Tower". britishlistedbuildings.co.uk. Retrieved 8 March 2011. "Wraysholme Tower". Visit Cumbria. Retrieved 5 July 2015. "The castles, towers and fortified buildings of Cumbria: Wraysholme Tower, Allithwaite". Matthewpemmott.co.uk. Retrieved 5 July 2015.